This is a billing software that solves your billing headaches with true what-you-see-is-what-you-get Excel invoice templates and backend databases. Combining the power of Microsoft Excel with backend databases, the billing software allows you to easily manage your customers, products, invoices and payments. This edition is the highest edition of the billing software. It supports unlimited number of companies. This means you can handle more than one business in a single billing system; even those businesses are very different in many aspects, including customers, products, reports, even tax systems. The billing software also supports networking, allowing you to share data with your colleagues. 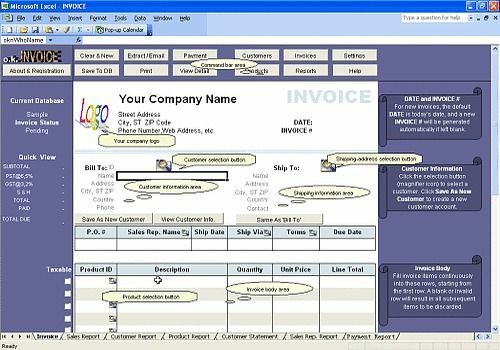 Since the billing software is based on Excel invoice templates, it is highly customizable. For example, you can easily customize the fonts, colors, text labels, currency symbols, number formats, and even the formulas for calculating taxes, with various tools provided by Excel. The billing software is designed with flexibility in mind. For example, all cells in the invoice template are identified by names - so, if you don't like where a field is placed, you can hover your mouse on the cell and drag it to a new location! This type of flexibility is also implemented in the database structure level of the billing software. In the Enterprise edition of the billing software, there is a powerful feature called custom fields, which allows you add your own fields to your invoices. For example, if you are running a travel agent business and need to know the number of children of a customer, then add a custom field Children. This new version added support for credit note/credit memo and a new payment report. Download the fully functional trial version to see how the billing software works for you.